With easily justified comparisons to the likes of early Thirty Seconds to Mars, flavors of Depeche Mode, and a wonderfully prominent influence of The Cure thrown into the mix, The Anix’s own brand of ethereal electronic rock has always seemed a project ultimately finding itself in slightly older roots stylistically. Sure, frontman and sole member Brandon Smith does of course still fully take advantage of the crisp, clear production values that modern technology allows, and the likes of Sleepwalker’s ‘Resident One’ perhaps being a little more The Killers than the album’s cover of Gerard McMahon/McMann’s ‘Cry Little Sister’ would have you believe, but in the end The Anix always seemed to feel best at home in the dripping atmosphere of 80s-90s electronic rock. An Illusion of Time might have had a lot more of the aggressive Nine Inch Nails influence to say about itself, but if a singular song were to be chosen that summarizes the best of The Anix’s work, it could easily be The Cure’s ‘Burn’ (this itself being a delightfully appropriate result, considering that the track was also covered on the secondary Sleepwalker disk). With this all in mind, being welcomed into the ranks of electronic rock-focused label FiXT certainly struck as a completely natural move forward to greener pastures: in being surrounded by similarly minded label-mates stylistically, Smith’s project feels entirely within its comfort zone for a brand new chapter, quickly bringing forward his latest effort, Shadow_Movement. 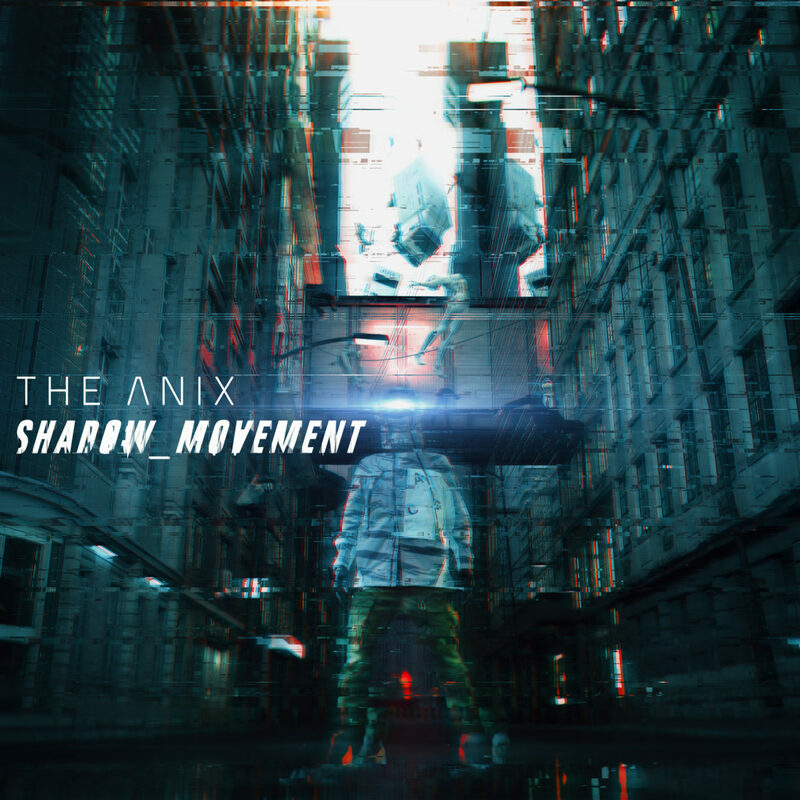 While incorporating an overarching dystopian and cyberpunk theme, and anthemic singles ‘Fight The Future’ and ‘This Machine’ already clearly displaying a chosen stylistic direction somewhere between the more rock-orientated Sleepwalker and far more electronically-infused 2017 effort Ephemeral, Shadow_Movement immediately kicks things off on a high, with The Anix feeling plenty prepared to deliver another batch of energized, euphoric electronic rock tracks. Production-wise, it could be argued that this is the best Smith’s project has ever sounded, be it either due to further growth in personal experience, or experienced label support having had a particularly positive influence throughout the record’s conception: it all sounds crisper, cleaner, and ready to go. Ultimately, Shadow_Movement sounds good. In fact, at times it sounds very good: the instrumental backbone of the album is excellent, the songwriting confidently stands up in the face of Smith’s ambitious chosen dystopian concept, and vocally Smith’s range suits the direction of the music. Truthfully, Shadow_Movement only suffers on one note: digesting the album’s 15 track odyssey in its entirety. You see, in rooting itself so firmly in such an overarching concept, musically this is where a few tracks can start to blur together, losing their identity somewhat in the runtime and being overshadowed by others that better utilize the material at hand. As such, the only truthful criticism would perhaps be a simple matter of quantity over quality: in losing 2-3 tracks, and extending 1-2 to incorporate longer instrumental sections, Shadow_Movement would feel a far more interconnected and engaging experience, despite the clear ambition seen within the already existing body of work. Nevertheless, it can’t be denied that The Anix has delivered another batch of euphoric, electronic rock tracks that perfectly suit Smith’s stylistic range. It may not be perfect, but as a reintroduction to the project following a restructure of members and moving into a brand new label, Shadow_Movement is a commendable effort. Mark is a twenty-something guy with a love for virtually things all music, having been brought up with the likes of Deep Purple to Fleetwood Mac, and through the golden era of early 2000s rock. With this in mind, an obsession with finding new and wonderfully cathartic soundscapes has led to looking for what delightfully captivates, while always looking ahead for the next amazing artist.